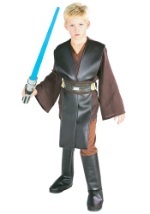 Become an unruly Jedi Knight this Halloween in our child deluxe Qui Gon Jinn costume! It comes with tunic and a 100% polyester shirt with sashes attached. The polyester pants have a stretchy elastic waistband for additional comfort and attached boot covers. The included belt has a detailed design and ties together in the back. Add a Jedi braid and Qui Gon Jinn's signature lightsaber to this costume for great Star Wars accessories!